What’s children’s health got to do with criminal justice reform? Much of the recent discourse on criminal justice reform centers around incarcerated individuals themselves and the crimes that put them in prison. The impact of imprisonment on inmates’ families, however, often flies under the radar. Dr. Nia Heard-Garris of Northwestern University and her team recently took a closer look. In their study published by the American Academy of Pediatrics last month, Heard-Garris et. al. use a survey to determine the effects of mother and/or father incarceration on adolescent health. They find associations between parent incarceration and forgone medical care and prescription drug abuse. Since caregiving responsibilities are likely to shift when a parent begins a prison sentence, these correlations make sense. Disruptions in what used to be regular doctors’ appointments become the new normal. Mother incarceration, specifically, correlates with a higher number of emergency department visits by her child(ren). This is a problem as emergency rooms aren’t meant to be sites for primary care. It also could indicate children of incarcerated mothers (or their new caretakers) are too often waiting until their ailments become absolutely urgent before seeking care. Father incarceration, on the other hand, correlates with illicit injected drug use by his child(ren). Given the U.S. has the highest incarceration rate in the world, and nearly 60% of incarcerated adults in the U.S. are parents to minors, these findings are extremely significant. Notably, Heard-Garris et. al. limited the definition of parents in their study to biological father and mother, suggesting that the impact may be even greater if imprisonment of any primary caregiver were studied. The study highlights how problems of the criminal justice system extend beyond just convicted felons. Furthermore, young black adults in the survey experienced disproportionate rates of parent incarceration, raising concerns about the community experience of parent incarceration (in addition to the individual impacts the study evaluated). For example, what does it mean for a child to experience parent incarceration alongside many his friends also experiencing parent incarceration? The authors’ research underscores the importance of considering the children of convicts amidst critical conversations on criminal justice reform. In 2015 and 2016, new anti-discrimination federal rules required insurance plans to cover preventive services for transgender and gender non-conforming youth, in addition to prohibiting plans from denying insurance and service coverage for transgender youth. The expansion and victories for transgender-based rights during this period were momentous, however recent national discussion to remove the anti-discrimination laws is worrisome. The number of transgender children and youth is rising, as seen by the increase in individuals seeking care for gender dysphoria. Gender dysphoria is defined by the American Psychiatric Association as “a conflict between a person’s physical or assigned gender and the gender with which he/she/they identify,” which can often lead to feelings of strong discomfort and distress. Gender nonconformity (or gender expansiveness) is not the same thing as gender dysphoria, as gender nonconformity relates to “behaviors not matching the gender norms” of an individual’s gender assigned at birth. Research shows how transgender-based youth are high at risk for self-harm, depression, anxiety, substance abuse, and other mental-health concerns, with many also facing harassment and discrimination in every-day life. Utilizing gender-affirming healthcare such as hormone therapy, puberty-blockers, or gender-reassignment surgery can minimize the challenges many children, youth, and adults face, providing a better quality of life. This fact is what makes recent policy shifts more troubling. NPR recently featured an article about one particular youth who initially lost coverage for a gender-reassignment operation in Wisconsin, when the state’s Group Insurance Board voted to “exclude coverage for gender reassignment or sexual transformation” for state employees. The decision came during the recent national rhetoric of many socially conservative politicians calling the 2016 anti-discrimination rule “unlawful”. Although the youth was ultimately able to get her surgery by striking a deal with her hospital to pay about $20,000 upfront, many people may not be able to afford this privilege. There are more stories out there of children and youth facing difficulty with transgender-based insurance coverage and experiences in the healthcare setting. It is imperative that policymakers and local and national officials realize the negative consequences of discriminatory national discourse and policy changes for the mental, social, and physical health and wellbeing of transgender-based children and youth. Earlier this month at a United Nations assembly, the Trump administration’s delegate opposed a resolution encouraging breastfeeding. This has re-sparked some decades-old debates on breastfeeding versus formula and the strong arm of the baby formula industry, both in the United States and globally. Note that most of these findings show correlation, not causation, and may have confounding influences like family income or education level. Nonetheless, given all of the positive incentives for children and mothers, CHIL follows global health organizations in encouraging breastfeeding for women able to choose. For mothers unable to breastfeed, whether due to physical or lifestyle constraints, formula certainly can be a strong alternative offering convenience and variety. Be sure to discuss your feeding options with your OBGYN and/or your child’s pediatrician. Additionally, there are abundant resources online to help guide formula selection. A recent article in the Philly Voice discusses the value of teaching our children to be eco-friendly, and how respecting our planet can lead to healthier surroundings and families. However, “being green” can be expensive. Underserved communities may not be able to prioritize green living as a result, although they still bear a large burden from environmental degradation. Even small steps can help communities move towards more sustainable living, and families can still be friendly and conscious of the environment on a budget. We have compiled a list of easy things parents and children from all walks of life can learn and do to live a greener and healthier life. “Reduce, reuse, recycle” -- Whether it be getting takeout food with your own reusable containers, using hand-me-downs, or recycling boxes and bottles; these are all great habits to teach your kids and practice yourself. Even setting an alarm for showering or other types of water or electricity consumption can be helpful to make these actions eventual habits! New York City and Philadelphia also provide information on recycling spots in different neighborhoods. A simple Google search for other communities may help you find out where you can recycle and when your neighborhood recycle collection days are! Rethinking Plastic -- Buy some cheap cloth bags that can be used when going grocery shopping, instead of receiving plastic bags from the market. Even this small gesture can make a huge difference in the way families consume plastic. Parks & Beaches -- In some of our previous blog posts, we’ve discussed the value of taking children outdoors and keeping their brains occupied, especially during the summer. Trade in a movie marathon one day for a walk in the park. Walk, Bike, Carpool, or Use Public Transportation! -- Not only can these options be cheaper than using a car, but they also reduce the amount of toxins or greenhouse gases released into the air. Encourage your children to do the same, and teach them the value of eco-friendly transportation options! Parents can also encourage their kids to grow vegetables or fruit of their liking inside or outside of the house, or go to a local library to check out books about environmentally friendly practices like The Lorax by Dr. Seuss. There are plenty more ways to learn and practice living a greener life. Check out this website for more tips! This past June 17th, Father’s Day was celebrated around the country and globe. Even with a day dedicated to commemorating fathers, we often overlook the crucial role fathers play in the development of their children, beyond what is conventionally considered or is traditionally applied to mothers. In any type of family, traditional or nontraditional, the family unit involves teamwork in a child’s upbringing regardless of who raises the child. For those families with a father present, recent research showcases that the involvement of a father in his child’s life can have a large impact on the child’s diet, discipline, and exercise, among other aspects of the child’s immediate well-being. More engaged fathers can also affect long-term development of children, such as improving self-esteem, enhancing performance in school, and leading to lower rates of depression, anxiety, or teenage pregnancy. For many fathers, it can be difficult to be highly involved in a child’s life, especially in a country like the United States, where most states and companies do not provide paid paternal leave. In fact, the United States is the only country in the industrialized world that has no paid family leave for mothers or fathers. This can make it especially challenging for fathers to spend quality time with their children after birth, or even cope with the stressors that afflict many families after welcoming a new child. For instance, many new fathers face similar challenges to new mothers, such as gaining weight or experiencing depressive symptoms after the birth of a child. However, countries like Sweden are trailblazers when it comes to addressing these issues. Sweden has sought to increase the involvement of fathers in family roles and improve gender equality by legally providing 480 days off from work (to be shared by both parents) for each child in their home. The goal of such policies is to improve “social benefits” while also allowing women more freedom to “become more active members of the workforce.” Paid family leave is the norm in Sweden--many Swedes claim that it can even be looked down upon if a father does not take days off from work after the arrival of a new child. Regardless of whether such policies will eventually come to the U.S., one thing is for certain--in families with dads, fathers play a more crucial role than we realize. In CHIL’s blog post last week, we mentioned Mary’s Center, a community health clinic in Washington D.C. This week, we want to emphasize that clinics like this one are available all over the nation. In fact, there are about 1,400 community health clinics (CHCs) in the U.S. While undocumented immigrants and Dreamers are ineligible to enroll in the federally-subsidized health insurance plans provided via the Affordable Care Act, CHCs often offer a good alternative for anyone seeking affordable health care—both citizens and non-citizens alike. Additionally, these clinics do not operate under any low-income or insurance coverage eligibility requirements; that is, a family with a working parent covered by some form of health insurance is welcome at places like Mary’s Center, too. Medical costs in the United States’ largely privatized system indeed can be overwhelmingly burdensome, even for people with steady employment. So, how do CHCs operate? What services do they provide for individuals and families, and at what cost? CHCs are nonprofits that receive funding from a myriad of sources including federal, state, or local grants and/or Medicaid payments. Some may partially rely on private funding sources as well. Because several institutions finance each CHC, in most cases, this provides the centers with a safety net. If one funding source is compromised—something common in the U.S. as administrations shift—CHCs have other means to remain afloat. Apart from providing comprehensive primary care, CHCs may address local needs like care in foreign languages or medical translators (for which their local community board can advocate). Another example is Mary’s Center partnership with Briya Public Charter School. Briya holds classes at Mary’s Center, providing an educational space for both parents and their children. Briya’s model works well for teenage parents who otherwise may have had to forgo public education. They also offer a counseling and educational group for (future) parents to attend throughout pregnancy; a program called "centering." These two programs are particularly useful for the areas Mary’s Center serves, where there are many young families. The localized care many CHCs provides sets them apart from other medical facilities and makes them integral to the health of thousands of children living in the U.S. today, particularly living in vulnerable and underprivileged families. If you or your kids are in need of affordable health care, CHIL recommends looking into your local CHCs for medical services. This search tool can help: https://findahealthcenter.hrsa.gov/. In the past couple weeks, immigrant officials at the U.S.-Mexico border have separated migrant children from their parents, prompting national outcry. Despite the signing of an executive order last week to halt the practice, evidence shows that trauma from separation can persist in a child, even after reuniting with their parents. Children are susceptible to the same stress response as adults. However, not having a parent to comfort or alleviate their stress can cause harmful and sometimes irreversible effects. Their immune systems may become weaker and less able to fend off infections. In addition, the stress response in children can induce long-term effects such as post-traumatic stress disorder (PTSD), depression, or substance abuse. Some migrant children are able to join foster parents; however, many others are held at detention centers across the country. The detention centers’ ability to provide support to children is often complex and ambiguous, due to strict rules sometimes limiting physical contact between staff workers and children. Although children crossing the border in the past couple years were predominantly adolescents, many children detained recently are younger than age five and have very different needs. In addition, even if placed with foster families, children with trauma display abnormal behavior for their age, such as crying constantly, having separation anxiety, and being unable to leave their foster parents’ side. It surely does not help that some of these children are also fleeing violence in their home countries, facing residual trauma from those experiences as well. A recent executive order now allows families to be kept together when taken to detention facilities at the U.S. border. Moreover, a recent court ruling requires previously separated minors to be reunited with their families within thirty days by U.S. officials. Of utmost importance is the provision of mental health services to migrant children--not only to those separated in the past month, but also those crossing the border today, with or without family. Programs like the Mary’s Center in Washington D.C. work toward this goal, by providing therapy and assisting migrant children in schools. However, public services to aid undocumented individuals are oftentimes limited in the U.S. In addition, many undocumented individuals may find it difficult to seek help due to fear of retaliation. Given the adverse health effects migrant children may face, efforts to alleviate the long-term traumatic consequences of immigration on inculpable and vulnerable minors is imperative. Helmets provide protection, but they get a bad rep. How can adults encourage kids to wear them? Summertime and bike riding go hand in hand. The pleasant weather invites cyclists of all ages, and for kids, bikes grant independence. They can get from place to place using environmentally friendly transportation and without relying on Mom or Dad for rides. This can be especially important during long summer days because, unfortunately, most parents and/or caretakers don’t get a summer vacation from work. Moreover, they are free to use! Even if the initial investment is a financial burden, many cities offer free or subsidized bike-sharing programs. CHIL encourages kids to take advantage of this prime bike-riding time. At the same time, we support the use of bike helmets as they improve safety. We know they’re hot and sweaty, they give you helmet hair, and the chances of getting in an accident, statistically, are small. We get it. Wearing a helmet requires taking on a short-term cost with an unknown reward. Ivers makes it clear that wearing a helmet is good for your health—so much so that some health insurance companies even offer monetary incentives (both positive and negative) to helmet-wearing, like covering the cost of helmet or revoking coverage in accidents where the rider is without helmet. We want to emphasize that wearing a helmet while bike riding makes an already-healthy activity even more healthy. Encourage good habits. From the first time they start riding with training wheels, have them where a helmet. Make it clear that putting the helmet on and getting on the bike should happen simultaneously, just like putting on a seatbelt in the car. Let them pick out the helmet they would like. Many retailers carry a plethora of options with different colors and décor. Stickers are also fair game. The helmet can become a fun accessory, and unlike clothes, kids won’t outgrow them every year! Set an example for them by always wearing a helmet when you ride. Point out celebrity cyclists (or other admirable figures in their lives) wearing helmets. Be sure to use positive reinforcement—praise children when they do wear their helmets rather than only scolding when they don’t. Bike riding should be fun, but it also should be done safely—especially when it comes to younger riders. Wearing helmet should not have to compromise the enjoyment of biking for kids, and with the right encouragement, it doesn’t have to. As #WhereAreTheChildren flooded Facebook and Twitter posts this past week, CHIL is taking a closer look at the role of social media in issues like child immigration policy and why such policies are relevant to children’s health in the first place. Given the nuanced nature and diverse moving parts, we will cover this topic in a series of posts. There are millions of immigrant children living in the U.S., some of whom have undertaken incredibly risky journeys along the way. From on-the-ground Border Patrol agents to broad, federal immigration policy, how our government treats minors upon arrival can impact their health and well-being. The #WhereAreTheChildren trend caught America’s attention by exposing the alarming number of 1,475 children unaccounted for on the part of the Department of Health and Human Services (HHS). So where are these 1,475 kids? In the worst-case scenario, some kids may have fallen victim to smugglers or human trafficking. However, experts caution many of these children are likely still safe with their sponsors, who are often parents or family members already living in the U.S. Eric Hargan, secretary for HHS, said in a statement that often sponsors cannot be reached because they themselves may be living as undocumented immigrants and are hesitant to talk with federal authorities. The lack of sponsor communication raises concerns about the health and safety of the children for whom they’re responsible. Even if a child is out of harm’s way, the sponsor could still fear using beneficial federal resources for the children. For example, undocumented children have the same right to public education as American citizens. In some states, there are federally-funded health clinics which are required to treat all people regardless of documentation status. However, if sponsors are reluctant to use federal systems in effort to avoid governmental authority, they and their children lose access to necessities like basic education and medicine. The 1,475 missing follow-up calls manifest the prevalence of this reluctance. Moreover, while interest in the well-being of immigrant children has spiked in recent weeks, the issue itself is decades old. Albeit much misinformation followed #WhereAreTheChildren, at the very least the hashtag drew much-needed attention to this vulnerable population of young kids. It forces us, as children’s health advocates and more broadly as Americans, to reflect on how we can better fight for the health of vulnerable populations; that is, fight for vulnerable populations not based on the media or political attention they accrue but rather based on their genuine need for allyship and aid. In the coming weeks, CHIL will take a look at current immigration policies in place to protect the health of immigrant children. Stay tuned. Let’s keep our minds engaged over the summer! School’s almost out, and as families prep for the summer, it can be good to help kids’ brains stay active and healthy. Stimulating the mind over the summer, which of course can be combined with relaxation and play, makes it easier for kids to transition back into school mode in August. As we all know, the mind and body are linked, so we came up with some ideas that can keep your child engaged inside or outside the house during the long summer days! Definitely check out our previous blog on some good ideas to make exercise fun and motivating for children over the warmer months. Blow bubbles: It can teach deep breathing, which is healthy for the heart and mind. Besides bringing a calming energy, it can also get your child out and about! Visit the local library: There are always fun summer activities planned at the library, as well as reading challenges and the opportunity to win prizes. It gets kids using their brains and some time out of the house! Visit museums and local parks: Maybe you can check out a book from the library about a topic from the museum that interests your child, or a book about nature to take with them to the park! Try learning Yoga: Not only does it involve both the mind and body, but just like blowing bubbles, it can be a good start or end to an active day. Cosmic Kids Yoga even has videos up for kids to follow and have fun with! Teach your child how to use a stopwatch: This mom tried it and surprisingly it got her daughter to stay engaged with her own experiments in the house, like how long she could stand on one foot for! Try cooking together: Have you checked out our recipe post on making blueberry muffins yet? When it gets too hot outside, this can be a perfect indoor activity! Encourage volunteering: If your child loves animals, call your local animal shelter if they accept young volunteers! Some may accept children within a certain age to volunteer, or if they come with an adult. Habitat for Humanity has a youth program that offers volunteer opportunities to students as young as age five. Some other ideas include nursing homes, soup kitchens, or the local zoo. Here is also a resource guide with some websites to search for civic engagement opportunities: it’s never too early! The month of May has brought a host of new actions from the White House regarding children’s health. CHIL breaks down the recent news below. First, the President has called on Congress to cut $7 billion in funding from the Children’s Health Insurance Plan (CHIP). CHIP is a federal program that provides health insurance to 9 million otherwise-uncovered kids and over 300,000 pregnant mothers. (CHIL covered this issue in several posts if you need a refresher). It’s particularly special because it’s one of the few programs that has had bipartisan support for decades. After a hard fought congressional battle in 2017, CHIP received a necessary decade-long funding extension in January 2018 (CHIP CHIP Hooray!). Despite the win for children’s health in the beginning of the year, the Washington Post reports, “Congress can ‘rescind’ money it has previously authorized if it secures a majority of votes in the House and then the Senate using powers under the Congressional Budget and Impoundment Control Act of 1974.” This is the act President Trump would rely on to cut money from CHIP at this point, though the law hasn’t been employed to rescind funding in over 20 years. If faced with a ex post facto funding cut from the federal government, many states may be left with no choice but to scale back their CHIP enrollments and/or benefits. We caught a glimpse of the detrimental impact jeopardized federal resources can have on CHIP back in late 2017, when some states took preemptive measures in anticipation of losing their CHIP funding. Connecticut, for instance, froze enrollment in December. Colorado and Virginia had plans to phase out coverage for pregnant women starting in January. CHIP is an extremely important measure for child health, as CHIL expressed back in September and October, and it heavily relies on federal government money. We hope that the vital health insurance program will continue to receive the Congressional support it needs to adequately aid its worthy beneficiaries: disadvantaged women and children. Notably, while President Trump has operated at odds with CHIP this month, by contrast First Lady Melania Trump unveiled her “Be Best” initiative to improve child well-being on May 17th. She has followed many of her predecessors--namely, Michelle Obama, Laura Bush, Barbara Bush, and Nancy Reagan--in specifically focusing on children’s issues. As mothers themselves, after all, children’s topics hit close to home regardless of political ideology. Though the details of the “Be Best” campaign have yet to unveil, the initiative’s three goals are to improve child well-being, take on cyber bullying amidst today’s increased social media presence, and tackle the opioid crisis so as to reduce the number of children born with addictions (an ongoing issue CHIL wrote about last week). Ms. Trump’s outlined goals are promising, and CHIL is looking forward to learning the specifics of her children-centered plans in the coming months. It has gripped the nation for the past couple years, with media outlets, local mayors, school systems, and community leaders all talking about it. The president even declared it a “national public health emergency” last year. The opioid epidemic has penetrated the very fabric of America, regardless of race, age, and socioeconomic background, yet most have forgotten the infants and children affected as collateral damage. The New York Times recently reported on these children, discussing the struggles many opioid-addicted women face when encountering an unexpected pregnancy. How can they circumvent their child from being born with Neonatal Abstinence Syndrome (NAS), a condition in which babies experience opioid withdrawal? Many expectant mothers attempt to curb their drug use patterns; however, it often proves to be difficult. Doctors recommend that opioid-addicted pregnant women use methadone or buprenorphine, both substitutes of opioids, to help wean them off their addiction while also helping their baby experience a better birth and potentially better health outcomes. However, there is a caveat--the child may still be born with NAS, as both replacement drugs are also opioids. Limited research exists regarding NAS’s long term effects, however preliminary data from ongoing studies suggest that NAS-born infants may hit the normal developmental range in their early childhood. In addition, even if there is a risk for NAS, mothers are able to obtain treatment by using methadone or buprenorphine, which will ultimately improve both the child’s and mother’s health in the long run. Some mothers have even indicated that becoming pregnant gave them an added responsibility and urgency that positively impacted their lives--even turning some of them sober. However, our society still deals with drug-addicted pregnant mothers punitively. In some states, babies born with NAS may be taken away from their mothers under the pretense of child abuse. The child may either be placed with other family members or in foster care as a result. However, children in foster care can enter an endless cycle into the welfare system, where they are more likely to grow up to become homeless, experience a teen pregnancy, or even abuse their own children if they were abused as a child. With all this information, it is crucial we take a hard look at how we treat mothers who may be addicted to drugs, and its potential impact on their children. By making these efforts, we can look towards a future where regardless of background, babies grow up to have bright and healthy childhoods. The Great Cooking Challenge: Update! 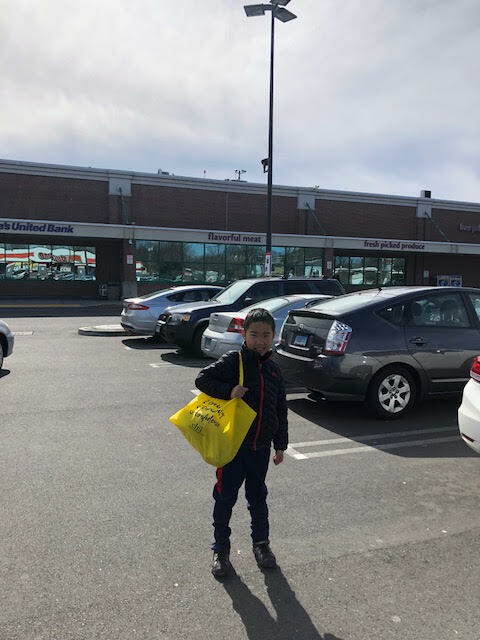 The Great Cooking Challenge, a program developed by our Small Grants Program 2017 winner Jessica Trinh, recently wrapped up and we are so excited to share one mom's story about her son's dedication to this project. We hope you enjoy Qiran's story (pictures are below)! My name is Ganlin. My son, Qiran, is in 3rd grade at East Rock School and has been cooking for a couple weeks. I want to share some cooking photos with you. This has been a fun experience for us. Qiran started to enjoy the joy of making food and stops thinking cooking is something kids cannot do. He was not very interested at the beginning but was attracted by the soda juice recipe. Over time, he enjoys more and more to turn ingredients into real dishes. He made banana pancakes earlier this week and shared with our neighborhood. He was very proud of that! Besides that, I am also very glad to see the cooking experience bring new/healthy food into his daily life. He started to have avocado toast for breakfast recently. We have been having avocado toast for ourselves for years and he always wanted to have jam on his toast. I am very happy to see he decided to put avocado on his toast lately (and shared with his 1 yr old brother)! …exists, and it’s here! This delicious muffin recipe published by the Harvard School of Public Health makes for a yummy, healthy baked good—a balance the usual pre-packaged muffin or even other homemade muffins often can’t match. No need to choose between taste and the doctor’s recommendations anymore. The blueberry delight has only 120 calories, no butter, double the fresh fruit, minimal added sugar, and will make an excellent snack or breakfast on-the-go option that both you and the kids you care for will love. Follow the instructions below when you’re ready to get baking! Place the rack in the top third of the oven and preheat the oven to 400 degrees Fahrenheit Line muffin tins with paper liners. In a large mixing bowl, combine the flours, baking powder, baking soda, salt, and orange zest. Add the fresh blueberries and toss gently to coat the blueberries in flour. This will help keep the blueberries suspended in the batter versus falling to the bottom. In a medium mixing bowl, lightly beat the eggs, then whisk in the buttermilk, brown sugar, canola oil, orange juice, and vanilla. Don’t worry if the mixture looks curdled or lumpy. Pour the wet ingredients into the dry ingredients and stir until most of the flour is incorporated. The mixture can be slightly lumpy; don’t over mix. Divide the batter among the 18 prepared muffin cups. Bake 12 to 14 minutes, until the muffins are golden brown around the edges. With Mother’s Day coming up on May 13th, many may not know the origins of the holiday celebrated across the world. In the 19th century, a community organizer named Ann Reeves Jarvis hosted “Mother’s Day work clubs” to help decrease infant mortality. We might assume that health outcomes have drastically improved since then, due to better quality of life and medical advancements. However, despite an improved trend overall in infant mortality rates in the United States, the disparity between white and black mothers has actually widened. A recent article in the New York Times titled “Why America’s Black Mothers and Babies Are in a Life-or-Death Crisis” details the disparity in not only infant mortality rates among black and white mothers, but also in maternal mortality. Black babies in the United States die at a rate of 11.3 per 1,000 black infants, while the rate is less than half for white babies at 4.9 per 1,000 white infants. This gap in infant mortality is actually worse now than it was in 1850. What is even more shocking is that this disparity does not decrease with higher education or social status. According to the article and the Brookings Institution, babies born to black mothers from a middle-class background with advanced degrees are more likely to die than babies born to low-income white mothers with a high school or middle school education. Research in recent decades has started to uncover the reasons for such a disparity--that the “experience of being a black woman in America”, one in which systemic and institutional racism persists in all walks of life and induces persistent stress, has resulted in worse health outcomes for black mothers. In addition to the physiological effects of racism, there is also the prevalence of racial bias in healthcare, which can result in misdiagnoses. Even with all the resources and money in the world, we know that black mothers are still not immune to these biases. For instance, tennis athlete Serena Williams discussed her own story recently of how healthcare providers initially disregarded her life-threatening symptoms of a pulmonary embolism before giving birth to her daughter. Racial biases in the healthcare system and its effects on children, mothers, and families is something we hope to explore in the upcoming months in further blog posts. One thing to keep in mind this Mother’s Day is that as much as we celebrate our mothers for everything they do, our healthcare system may be failing them in certain ways. However, despite the setback the United States has experienced in infant and maternal mortality rates for racial and ethnic minorities, steps are being taken by local municipalities to combat this issue. Research is starting to show the potential benefits of having a doula to provide emotional support and physical care for expecting mothers, which many providers and organizations are beginning to suggest for pregnant patients. Nonprofits like Make Your Date Detroit, which helps women in Detroit enroll in classes for prenatal education and partner with a mentor during their pregnancy, have shown promising outcomes as well. We hope similar discussions and initiatives continue to help improve the health outcomes of all mothers. Kids like things that are fun. How can adults make exercise fun? Given our posts in the past couple months about health technology and its incentive potential for children, we’ve also noted technology isn’t necessarily a prerequisite to encourage kids to get moving! This is especially important to keep in mind as health technology may have unintended, unhealthy consequences. Plus, there are plenty of other options that are easier on the wallet! We’ve compiled some easy, timeless ways to motivate children and teenagers to exercise below. Time Magazine reports that “For a child to be active, they have to really enjoy the activity.” One of the best ways to ensure this is to encourage kids to decide what activity they will do. Whether it’s supporting children in participating in the sports that interest them or asking them where they’d like to go hiking, giving young kids the autonomy to choose will allow them to look forward to it. Inviting friends is also an excellent way to create a positive environment for physical activity. Going on a bike ride? Invite a classmate. Playing a pick-up game of soccer? Tell the neighbors. It’s much harder for kids to turn down their friends’ excitement than their parents’. On a similar note, parents or caretakers joining in on the activity can be a game changer, especially when friends or neighbors aren’t around. Kids love to be able to show someone their mastsery and receive affirmation, and affirmation from a respected adult goes a long way. Moreover, it adds to enjoyment and satisfaction when Mom or Dad tries, say, the new hop-scotch challenge. These are just a few (of many) tips that we found repeatedly appearing when parsing through suggestions online. That being said, a plethora of other ideas are available with just a simple Google search! Every kid is different, so CHIL recommends trying out different methods and going with the ones that stick. As the weather gets warmer, take full advantage of the outdoor activity interests and positive young energy it brings! You may have noticed kids or adults carrying it around: in the subway, on the walk to school, or outside an office building. It’s a long, skinny, metal-like object--something you may even think is a pen if you don’t look at it hard enough. Even with its different colors, it’s not a writing utensil or a tool. It’s an e-cigarette, commonly known as a “vape”. Although some experts previously supported its use to help adult smokers decrease their cigarette habit, the e-cigarette market has unfortunately expanded from adult smokers to young kids in middle and high school. According to the New York Times, e-cigarettes are deceptive--not only because they come in different appealing flavors, but they are also easily concealable. Manufacturers have made them easily clippable to clothing or look like flash drives. E-cigarettes also contain a higher concentration of nicotine, an extremely addictive chemical, than actual cigarettes do. Despite this knowledge, limited research surrounds the long-term risks of e-cigarettes on health due to the newness of the product. There is also a gap in awareness among adults of the harmful effects of e-cigarettes. A report released by the Centers for Disease Control and Prevention showed that approximately 30% of surveyed adults did not know if secondhand exposure to aerosol, which contains nicotine and other hazardous chemicals, was harmful to children. In addition, about 40% of the surveyed adults indicated that secondhand aerosol exposure results in “little or some” harm to kids. All of these factors make it even more difficult to market a campaign against e-cigarette use. In addition, many manufacturers claim that their products are not intended for children, especially when federal law indicates e-cigarettes can only be purchased for those over 18 years of age. However, their marketing campaigns indicate otherwise. The New York Times states how companies advertise clothing lines that display their vape brand and sell “vape sauce”, which can be attractive to many teens. To combat the rise of e-cigarette use in educational settings, especially with limited federal regulation of vapes, many schools take it upon themselves to enact more stringent policies. Schools have started suspending students, putting monitors in bathrooms, and sometimes even requiring drug testing for those found with e-cigarettes, since marijuana can be smoked using a vape. However, the effect of stricter school policies on reduced use is still largely unknown. One thing we know for certain is that although cigarette use and popularity has drastically declined from a century ago, more than 3 million middle school and high school students still smoke regular cigarettes. A recent published study indicated how 12th grade e-cigarette smokers were 4 times more likely to use cigarettes, a year after indicating they had never smoked cigarettes before. Thus, a growing population of nicotine-addicted youth is possible, making it even more imperative that local, state, and national-level administrators take action in policy and research--either by further regulating the tobacco industry, or studying the health effects of e-cigarettes. Some states, like California, recently raised the age to buy e-cigarettes from 18 to 21, indicating a step in the right direction. Here is to hoping more states will follow. Whether it’s getting kids to wear seatbelts, trying to reduce the number of smokers, or motivating people to get tested for HIV, public health campaigns are all around us. Some campaigns have been around for decades, like the Safe to Sleep campaign to prevent Sudden Infant Death Syndrome (SIDS), while some have been fairly recent pushes, like promoting a soda tax to reduce added sugar consumption. New or not, almost all campaigns are similarly constructed: each contain a catchy slogan, a captivating image, and sometimes even a celebrity endorsement. Although there hasn’t been a plethora of empirical research detailing the effectiveness of such campaigns, it is commonly assumed that a successful public health intervention needs a persuasive element to it. One of the most famous and successful campaigns in the last century has been the one for vaccines, whether it be for polio, measles, or chickenpox. Vaccination has become such an important national topic that at any point during the school year, parents will inevitably see a poster saying Don’t Wait, Vaccinate. But are slogans and campaigns effective in getting people to do what health officials want them to do, like wearing a seatbelt or getting vaccinated? A recent study published in the issue of Psychological Science in the Public Interest has looked specifically at vaccination interventions, showing that contrary to popular belief, “shaping” the behavior of patients and parents to get vaccinated is more effective than persuasion itself. Shaping” behavior, such as requiring all kids at a preschool to have the flu vaccine, or incentivizing teenages to receive an HPV vaccine. Although this study specifically examines the role of persuasion in the success of vaccination interventions, other public health campaigns have been researched as well. For instance, when it comes to mass media campaigns, single behavior campaigns (such as vaccination or breast cancer screening) have a higher likelihood of success than campaigns targeting ongoing behaviors (such as exercising every day or eating healthy). Although translating research findings is not as easy when it comes to the nuances of different behaviors and health campaigns, there is one thing we know for sure: more research needs to be done--until then, we can stick to proactive behaviors like vaccinating as much as we can.